There is a background story to each of the aircraft at the museum. The background story for Bord 211 begins with preliminary visits and negotiations in Bulgaria in 2004. 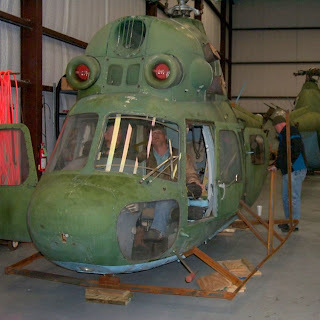 211 was one of a number of Mi2's that were stored on a portion of one of the bases that was visited. Here she is shown with some of her sister ships. Three others in this picture, 212, 213 and 214 are now undergoing restoration. Museum associates visited many bases and looked at many aircraft trying to make the best selection possible given the circumstances in each situation. Each of the aircraft in Eastern Europe had to be disassembled and crated for shipping. As they arrived they had to be cleared through customs, brought to the airport, unloaded and stored, as the Museum facilities had not yet been completed. 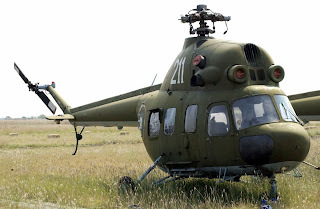 Here one of the Mi-2's is shown on its shipping cradle in intermediate storage. There were many steps along the way before assembly could begin and there are many more stories to tell. More details and back-stories about our aircraft will be covered in future posts.